OUT AND ABOUT IN MORRIS PARK THIS PAST WEEK, THERE ARE FRESH YOUNG TREE LEAVES, FLOWERING HERBACEOUS PLANTS AND LOTS OF GREEN GROWING THINGS. THE WEEK-LONG RAINSTORM FOLLOWED BY A FEW DAYS OF SUN HAVE CREATED A LUSH FOREST. 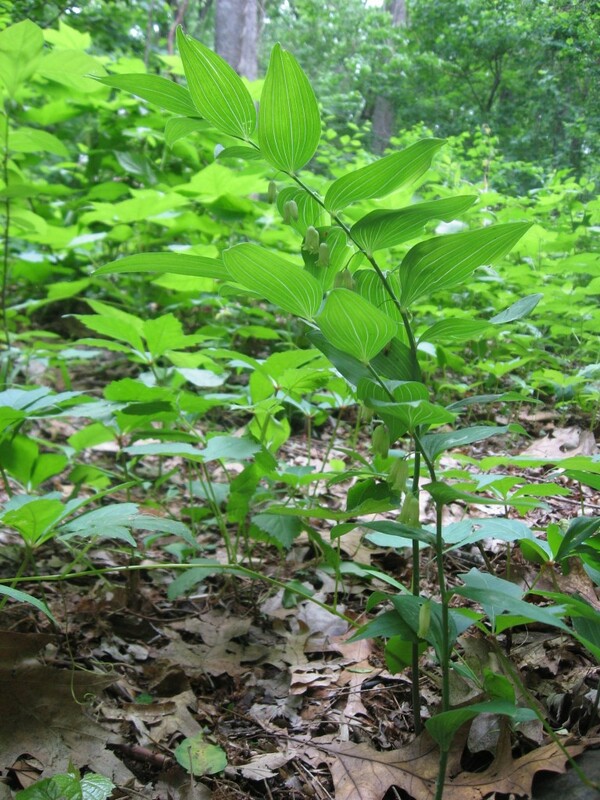 The Solomon’s seal is blooming. 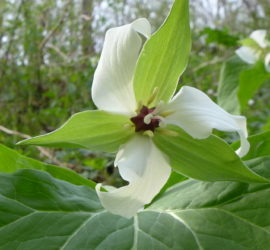 The white bell-shaped flowers hang in pairs on the Biflorum. The young leaves of Castanea dentata, the American Chestnut. If all goes well, native insects will start in on these, which is great because then there are lots of insects for birds to feed on. Good to get a shot of a leaf yet undisturbed. 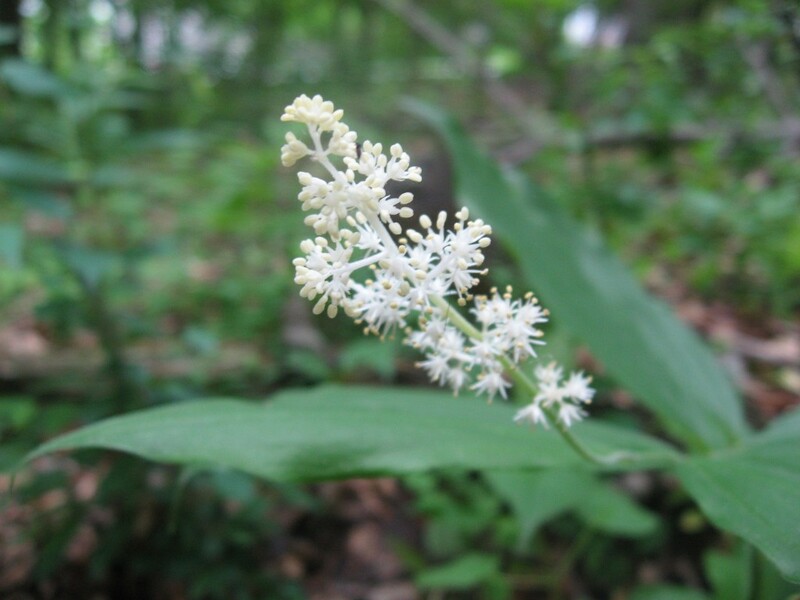 The False Solomon’s seal is blooming. 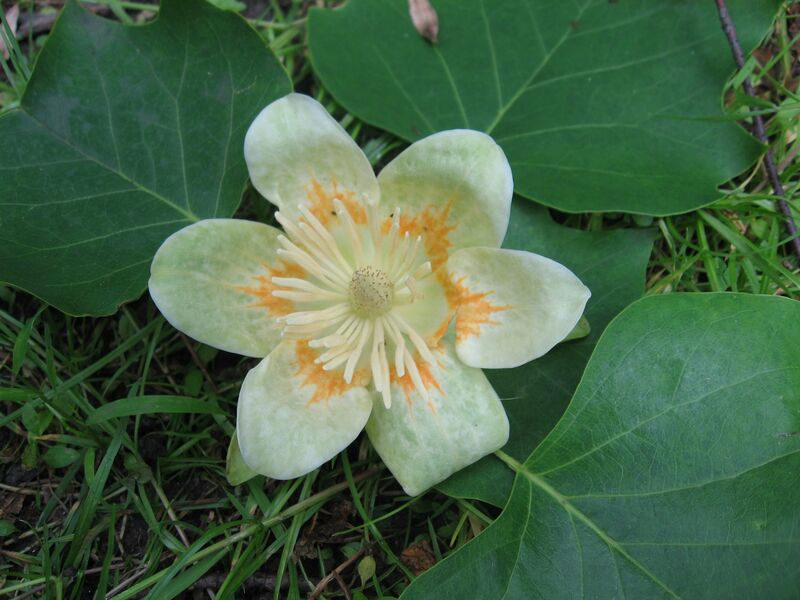 The blooms of Liriodendron tulipifera , the Tulip Poplar, are best viewed from ones that have broken off the tree and have landed on the ground in one piece. Below, the Lonicera sempervirens, the native honeysuckle is blooming away next to its fused, perfoliate leaf. 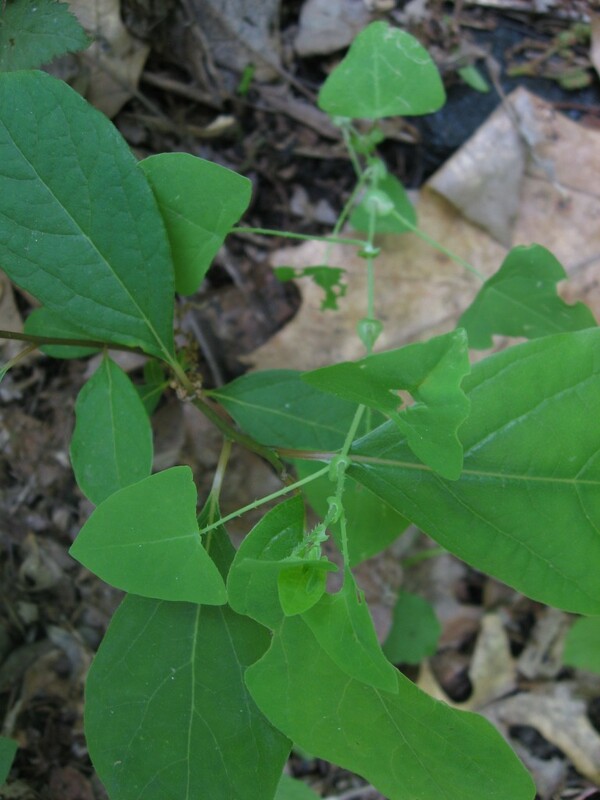 This is a signature characteristic of this vine, where only the last leaf before the flower is one round or oval leaf that looks like two leaves fused together and the rest of the leaves are single, simple leaves. This is a favored flower for hummingbirds. Maybe the big fused leaf has evolved in order to provide a good contrasting backdrop to the red flowers, so they are not missed by the hummingbirds that pollinate them. The fused leaf adds just that much more botanical interest to this vine. The next picture is a dead, mature oak tree, leaving us with only a handful of the old forest left. A standing dead tree is called a snag. The good news about this snag is that there are numerous oak seedlings and saplings all around it, and there are a handful of park volunteers and staff active in protecting this future forest from the harsh realities of an urban setting. An infestation of the Japanese Angelica tree (Aralia elata)has permeated the area all around the oak snag, threatening to shade out the young trees. Serious efforts have been made in an ongoing plan to control the Japanese Angelica tree. Also in the immediate area is the exotic invasive Garlic mustard (Alliaria petiolata), which threatens tree seedlings and saplings by altering the beneficial soil fungi that are important in tree root growth. Only just this season was an effort initiated by the Sanguine Root to control this invasive, a plan that will take at least 5 years of consistent hand-pulling on a yearly basis. As we are sad that the old oaks are dying off, this woodpecker on the left side of the snag, towards the top third of the picture above, is quite happy with the situation. Long after death, this tree will provide an important role in the native ecosystem. The photograph above, taken just yards away from the last scene is of yet another threat to the ecosystem. This one is an emerging threat in Morris Park, and one that sounds alarm bells whenever it is found. This is the Mile-a-Minute exotic invasive. Note the thorns along the stem, and also how the stem comes up through the middle of the small leaves. 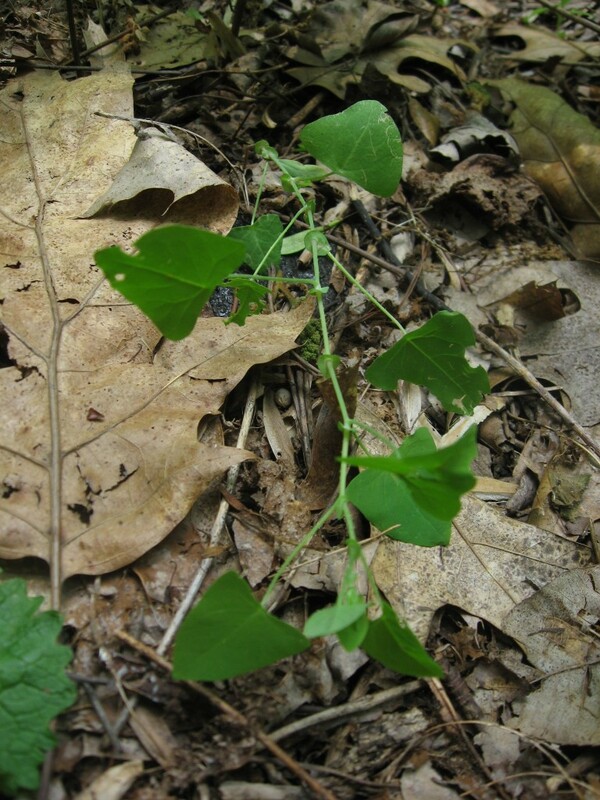 (These leaves, like with the Lonicera sempervirens, are also considered perfoliate). This one threatens the Spicebush seedling below it in the picture. This plant represents a clear danger to Morris Park, and we pull seedlings immediately wherever and whenever they are found. There is one area in Morris Park where it appears that soil was imported from elsewhere to fill in an eroded section of streambank along Indian Creek. The Mile-a-Minute grows abundantly from this soil, and we have spent some time removing the seedlings. If you see this in your yard, or in an area of land in which you have a stewardship role, it is highly recommended that after you have investigated it further for your own well rounded knowledge, that it be yanked out from there after. 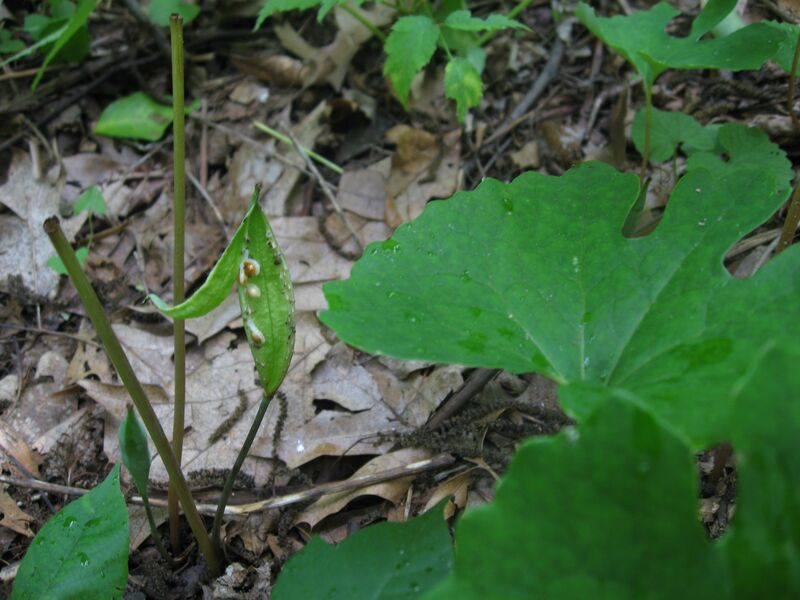 Not wanting to end this late Spring post with the dreaded Mile-a-Minute, we bring you the true harbinger of Late Spring, the first Bloodroot plant to break open its seed pouch. This event is the beginning of the final stages of Springtime, just like how the first flower of Bloodroot is the very beginning of Spring. This event was unfolding in a wooded location off the trails, and found during a routine Garlic-mustard removal second-pass exercise. The next few weeks will keep the ants busy as they haul off the bloodroot seeds so they can harvest the fleshy elaiosome that attaches the seed to the pod structure. While the elaiosome is desired as a food source, the seed itself is discarded in the ant waste pile, a well-drained place rich in nutrients, a place perfectly suited for the seed to germinate in, located far enough away from the parent plant to help the species spread. When this has been achieved, and the Bloodroot is just a leaf on a stem, then Spring is over. A TALE OF THE TWO DELAWARES: AMIDST CITIES AND 8 LANE HIGHWAYS, OIL REFINERIES, MEGA-MALLS AND MINI-MALLS, AND SEEMINGLY ENDLESS LOW-DENSITY SPRAWL IS A NATURAL LANDSCAPE FULL OF NATIVE TREES, SHRUBS AND FLOWERING HERBACEOUS PLANTS, BIRDS AND BUTTERFLIES. The contrast of natural landscape to urban sprawl is back-to back in New Castle County Delaware. At the intersection of Airport Road and Appleby Road is a mini-mall, a gas station, large swaths of parking, an apartment complex, lots of turn lanes and asphalt. This is the place that is driven through day in and day out. A place to merge on to the highway in order to get onto I-95. A place to buy gas. However, there is an amazing woodland that almost exists in a alternative reality, in almost exactly the same spot. This is the place where if you ever imagined what it must’ve looked like at this gas station 1000 years ago, at this exact spot, what was it like? Well, here at Appleby and Airport roads, All one has to do is cross the street, 150 feet and you are there, 1000, years ago. Lewden Green Park is the pre-strip-mall Delaware. It is hard to believe that such a place can even exist in such close proximity to such a thoroughly disturbed urban area. Yet Lewden Green Park is so rich in diversity of trees, shrubs and understory herbaceous vegetation, it must be accepted as fact. 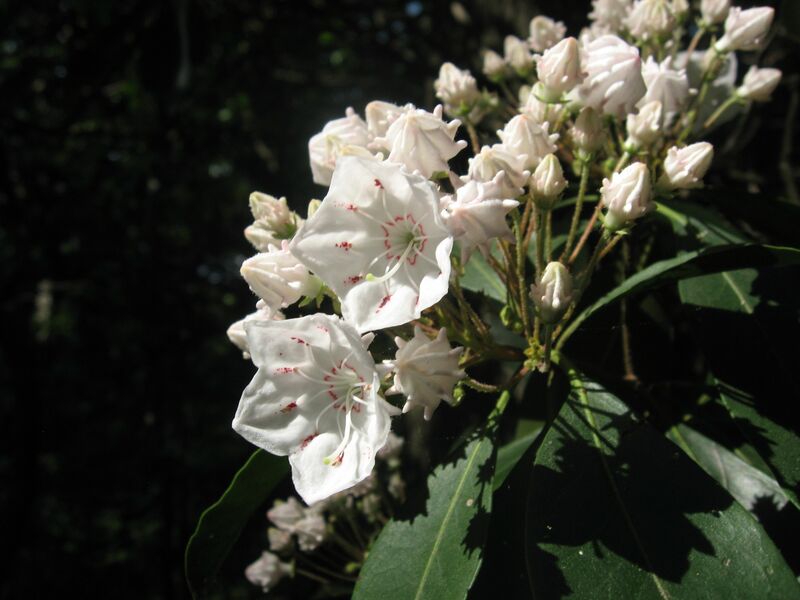 The above-pictured Kalmia latifolia is flowering in abundance in the Lewden Green park. 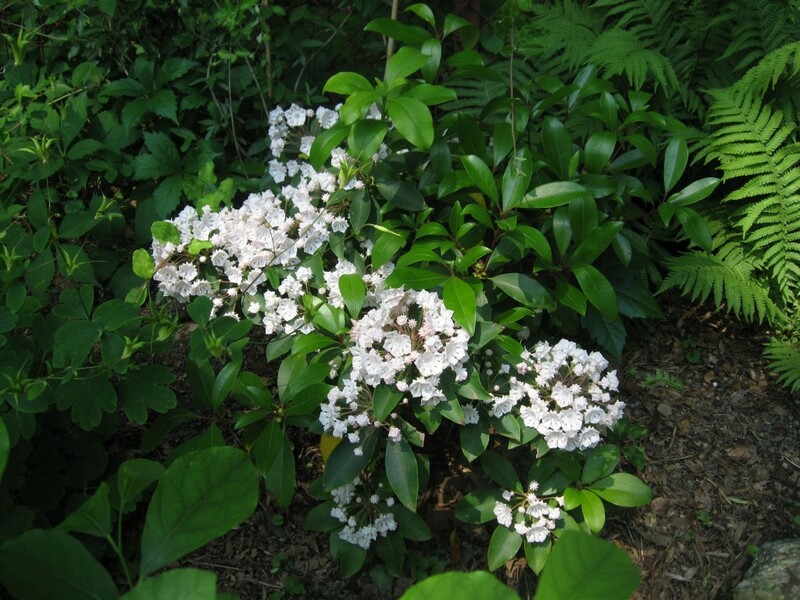 There are mature shrubs in full flower all over the park. 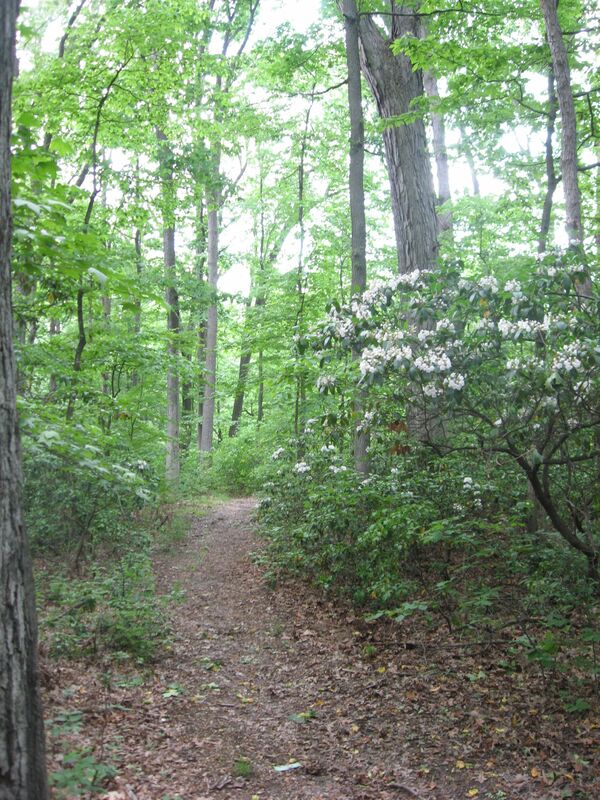 The woods is a joy to see: from the trails off into the forest is a shrub layer of blooming Mountain Laurel as well as maple leafed Viburnum. 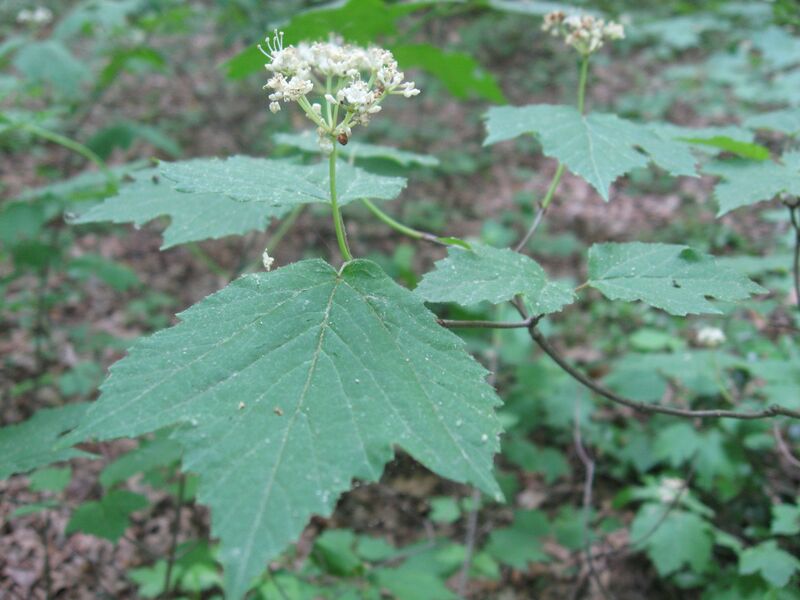 Oaks, Hickories, and Sweet-gum are in the canopy, and as we get closer to the Christiana River that flows through the park, there are Red Maples, Sycamores and Dogwood. 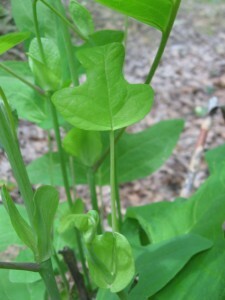 The Mayapples, Hay-scented ferns and False Solomons seals are on the forest floor. What did this spot look like 1000 years ago? 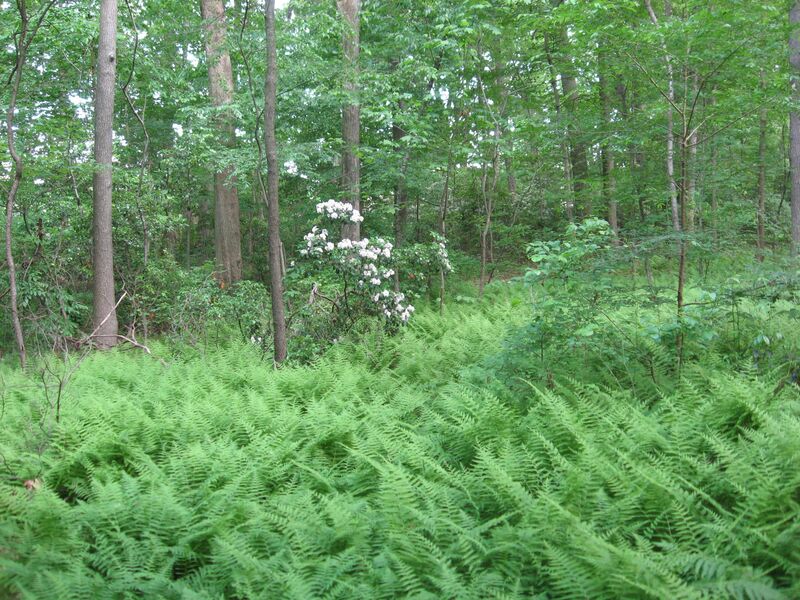 It could be argued that the overabundance of white-tailed deer can explain the hay-scented fern patch pictured here, being that the deer don’t like the hay-scented fern. Evidence was noted of the deer, in that the Mayapples were in some areas reduced to leaf-less stems, a familiar scene in Morris Park, Philadelphia. This absolutely magnificent flowering shrub has the answer. How many millions of years of evolution created this beauty? So, in this very spot, here in New Castle County Delaware, what was it like two hundred years ago in 1811? How about 300 years ago in 1711? 400 years ago in 1611? Ok then: 2000 years ago in just plain old 11? Was this bush blooming just like it is here, right in this spot? In Delaware? Whoever is helping maintain this park , you are doing a great job. This park is a treasure. 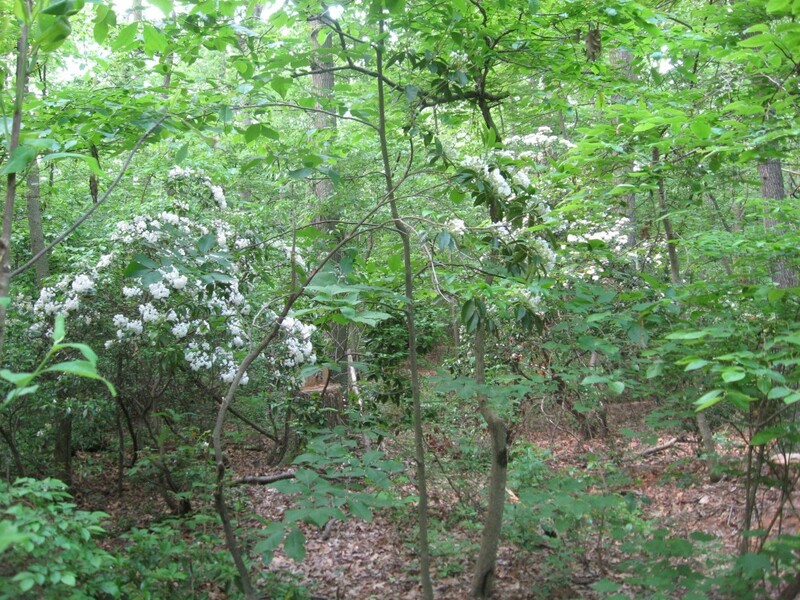 The invasive exotics Multiflora rose, and the Asiatic bittersweet, as well as the party spots with the beer cans and garbage, (also, the axe hackings of that poor mid-sized oak tree next to the pond ) are troublesome problems In Lewden Green Park. 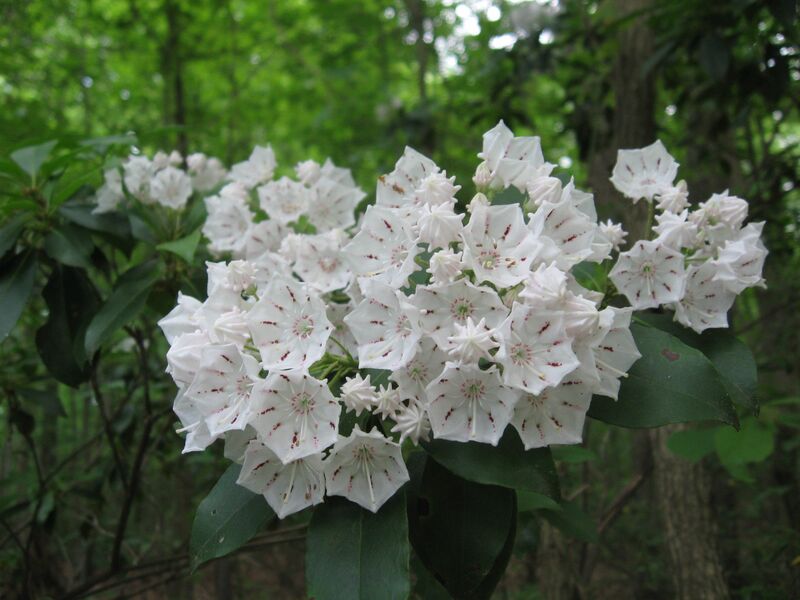 Delaware will enrich any itinerary of wildflower viewing in the Mid-Atlantic region. The birds like it here too. So these two pictures here are not in Lewden Green or even the Mt Cuba Center or Bowman’s Hill Preserve. They are in fact in our backyard. Thats right, this blooming beauty was purchased at a plant sale at Bowmans Hill Wildflower Preserve. These shrubs are great garden specimens. 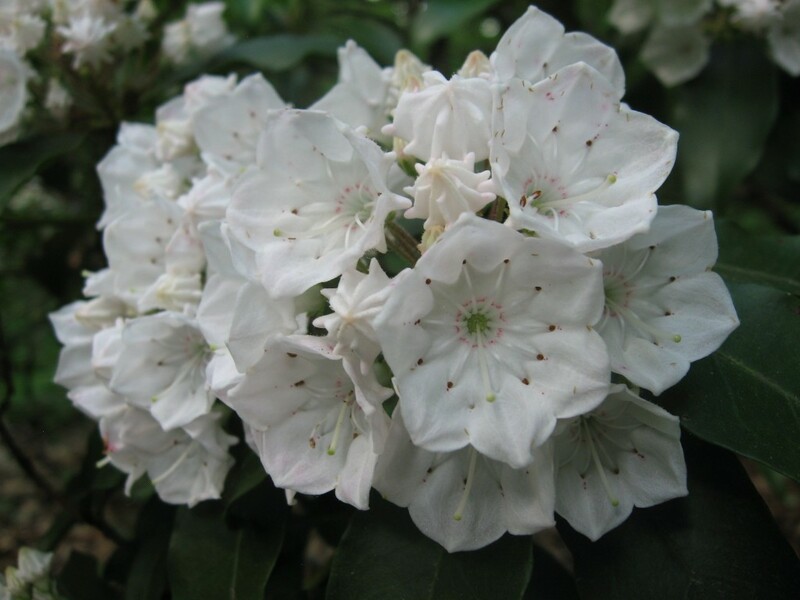 Rather than buy yet another Asian Azalea, perhaps your yard could be graced with this exquisite native shrub. 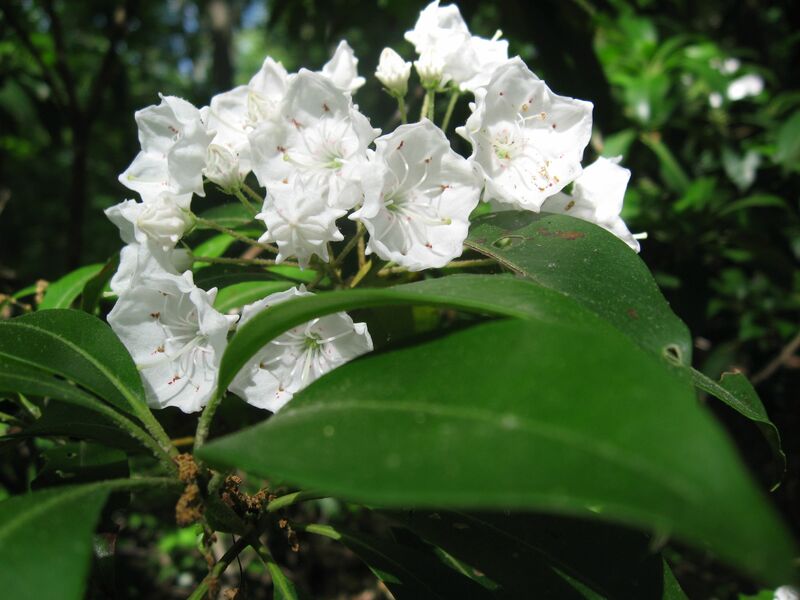 If you want birds in your yard, the insects that will visit the Mountain laurel will attract the hungry birds and pretty soon you will have a natural ecosystem happening in your own yard. 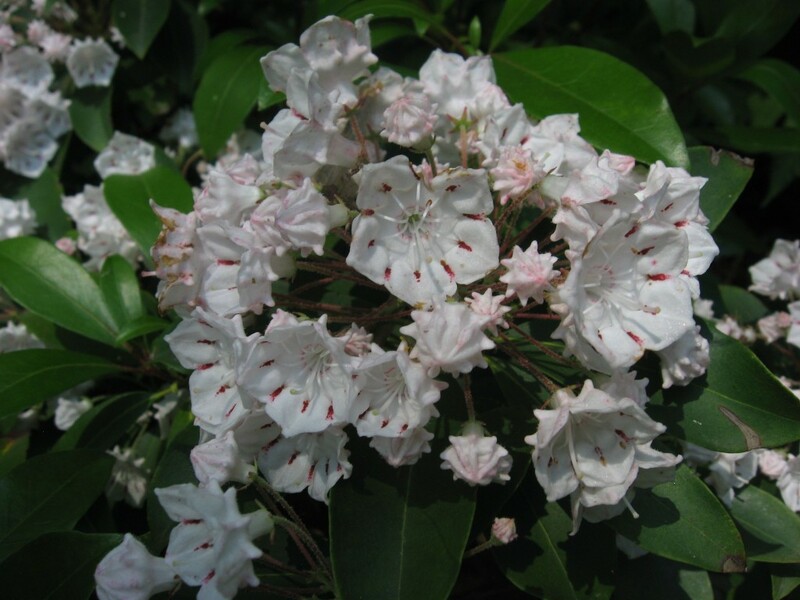 At your local native plant nursery, be sure to ask for Kalmia Latifolia. The latin name insures that you will get the right plant. IF YOU WANT TO SEE THESE TULIP POPLAR FLOWERS, YOU MAY NEED A PAIR OF BINOCULARS, BECAUSE THIS IS THE TALLEST BLOOMING TREE EAST OF THE MISSISSIPPI. We have one growing in our backyard, and we get out on the roof with a pair of binoculars and we can get a good look at the flowers. Often times squirrels will chew on a branch and a flower will fall to the ground in one piece and we are afforded a good look. After a storm , whole branches containing flowers can be found in Morris Park. In the forest these trees grow very straight and tall, but if a tree grows out in the open it will send out branches low on the trunk to reach all of the available light. It will only grow straight and tall if it has to and it can. So, to view the flowers as they bloom on the tree, find a big field or meadow in an area where Tulip poplars grow. We were in West Fairmount Park on Chamounix Drive near Ford Road, parked across from the tennis courts where we found ours. The branches extended out far from the trunk and very low at the tips where the flowers can be found. There is much to be admired about this native tree. 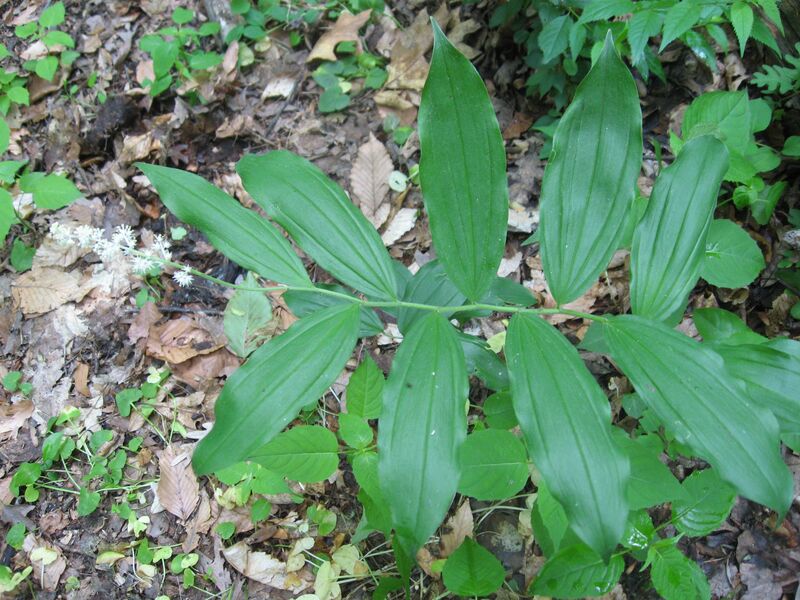 It is a fast grower, and it can be helpful in restoring a degraded forest canopy. 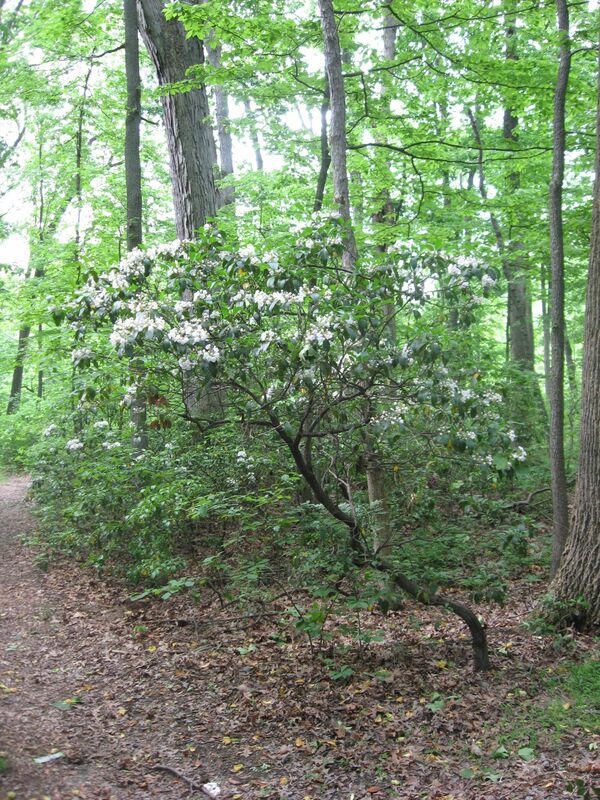 We anticipate that it will be an important ingredient in closing the canopy gaps of degraded woodland in Morris Park. While visiting The Mt Cuba Center in Delaware last Spring, they showed us a Tulip poplar they planted in their woodland Trillium garden 12 years prior in an effort to maintain a forest canopy. The tree was well on its way into creating the dappled shade much needed by Mt Cuba Center’s Trilliums and other woodland piedmont plants. Seeing this has helped us understand the importance of the Tulip Poplar in restoring a blighted urban forest. The beautiful orange and white flower is to be admired as well, and today we are celebrating its bloom. Here we can see the growth pattern of a Tulip Poplar in an open field environment. The v pattern is common for this tree, but this one has the divided trunk unusually low. Isabelle dressed for the occasion. 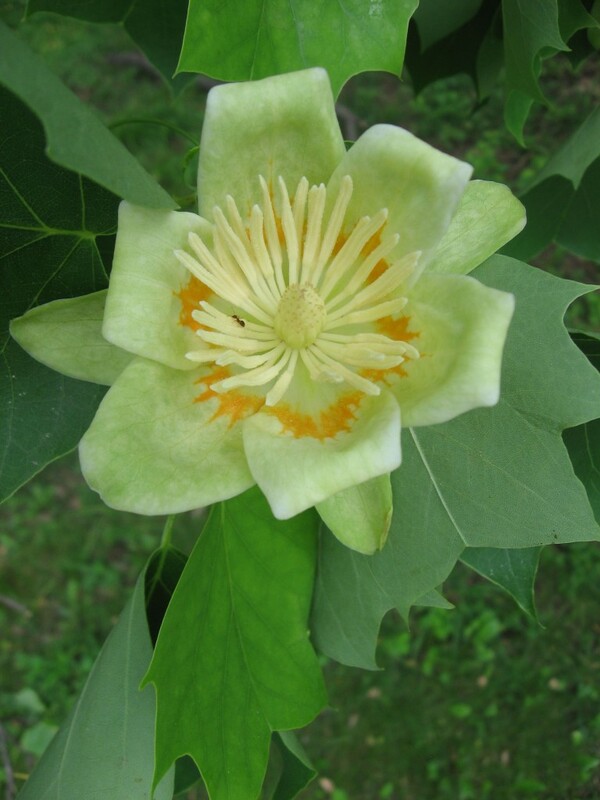 We were very disappointed to find out that the Tulip Poplar was “one of the least productive forest species in terms of its ability to support wildlife-insects and vertebrates alike” (Bringing Nature Home, 2007, Douglas W. Tallamy, page 65). We also know that the Tulip poplar has become a dominant tree species in the forest since the American Chestnut has become blighted and reduced to a shrub. 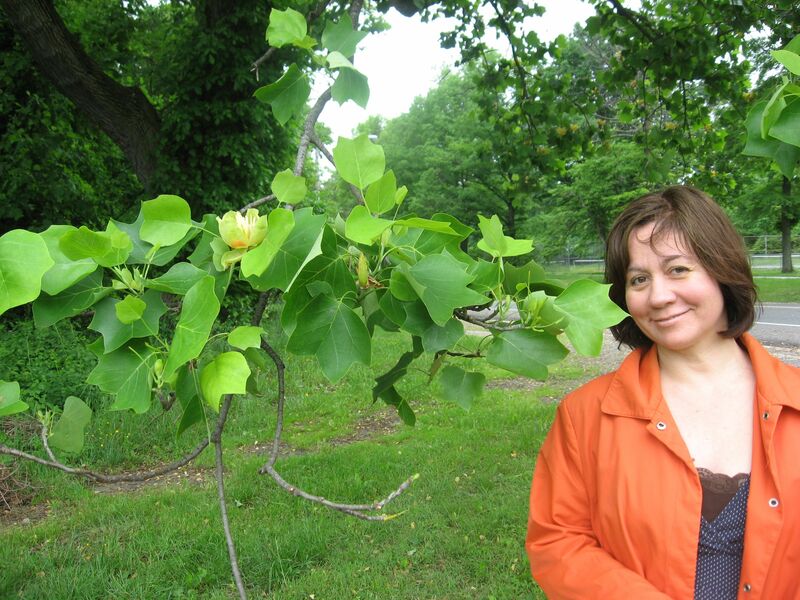 In Morris Park, there are numerous shrub specimens of the Chestnut (Castenea dentata), (Some reaching 25 feet in height) and there are large, mature stands of the Tulip Poplar. The Tulip Poplar has for the time being, benefitted from the demise of the Chestnut tree. So currently, the Tulip Poplar is able to seed itself abundantly and it has attained a dominant status in the forest: it is a species adapting to a forest out of balance. 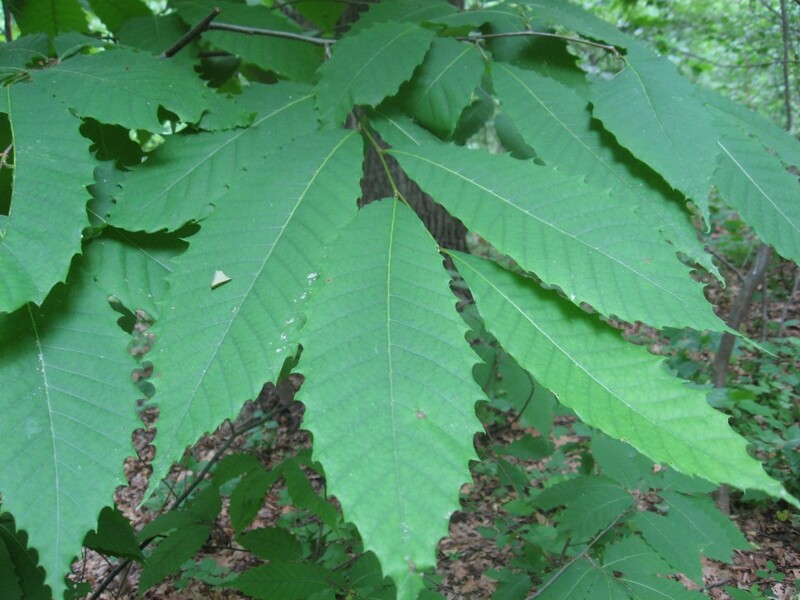 The Chestnut Tree has for millions of years been the dominant tree in the forest. We are just over only 100 years of Chestnut tree eradication from the forest canopy. The Tulip Poplar has taken over dominance in some areas of Morris Park. The Oak trees that seem to have had a dominant role in the canopy seem to be on the decline. 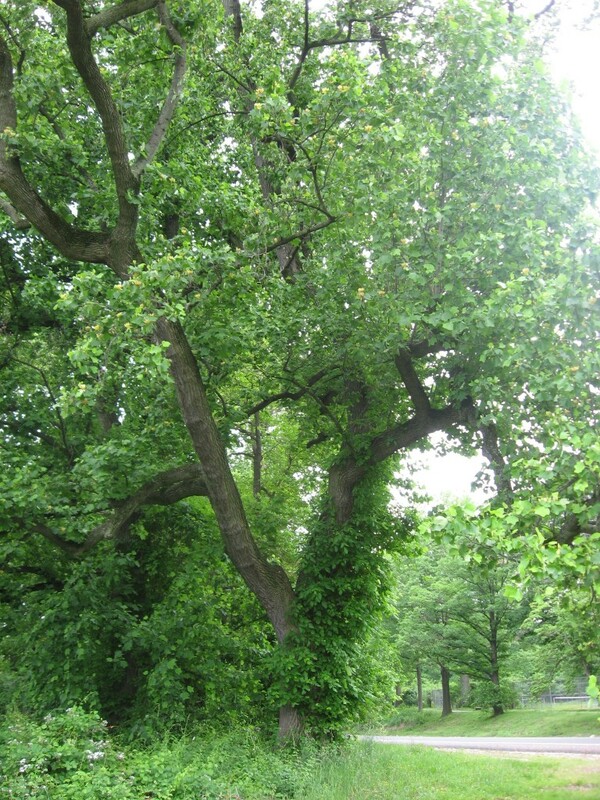 There are fewer mid-sized oaks in the park than mid-sized Tulip trees and even fewer mature specimens. However, there is an abundance of sapling oaks in one specific area very near our house. We have been sure to prioritize this area in invasive removal to give the oaks the utmost advantage in success. 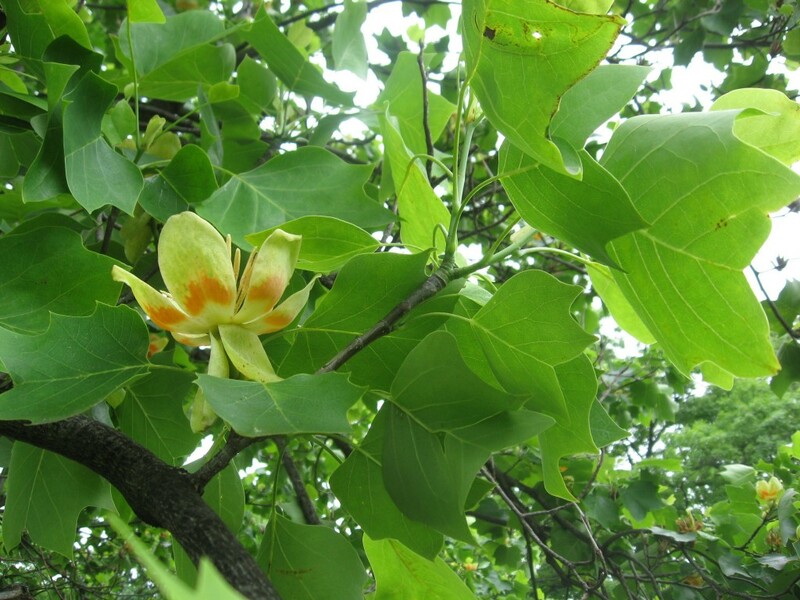 One other concern about the Tulip tree’s increasing dominance is that if there were ever a disease that blighted the species, there could be a catastrophic loss of canopy in many forests. Morris Park would be severely effected. 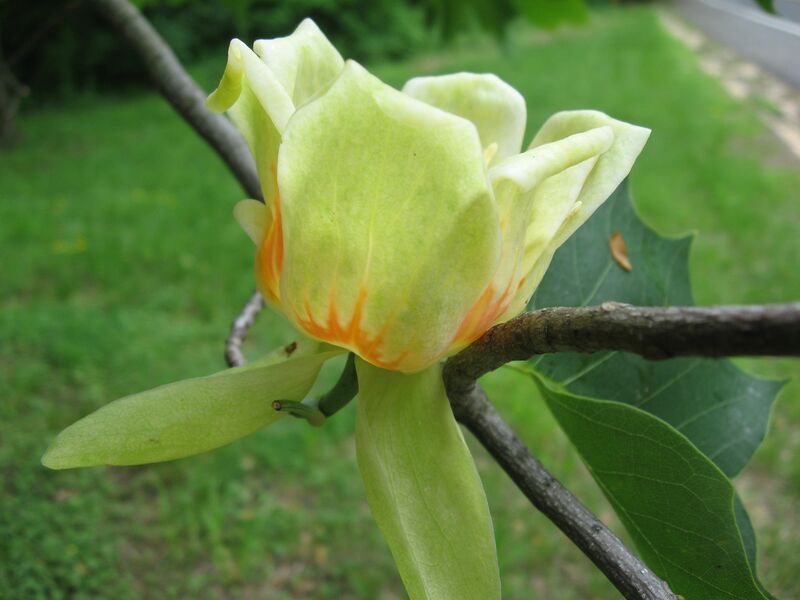 The flowers of the Tulip Poplar always stop us in our tracks. Will this native forest tree continue to help blighted urban and suburban forest remnants remain forested or will it outcompete other native forest trees such as oaks and beeches in an imbalanced charge to dominance? We are now weeding saplings of this tree from our yard, and we are seeing more Tulip Poplar saplings than Oak saplings grow in the most disturbed areas of the park. Is this tree on its way to being a prominent example of a native plant gone invasive in a disturbed ecosystem? 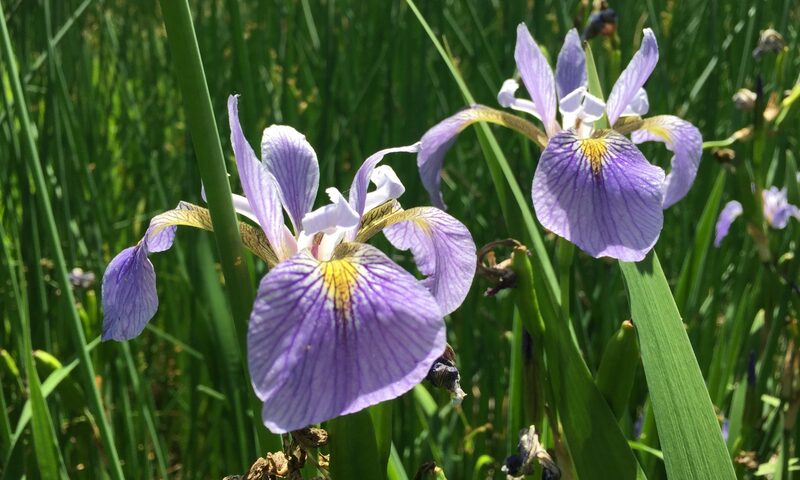 We often come across emotionally charged opinions about the issue of native plants, non-native plants, and even native plants that have become invasive. The opinions, even the sophisticated assertions about the status of a species, as well as the most thoughtful observations are still speculation until studied. When these questions arise, we must turn to science for some answers. The scientists think about these questions all the time, and spend much effort devising ways to study these questions. All of these ways are carefully described in their published studies. 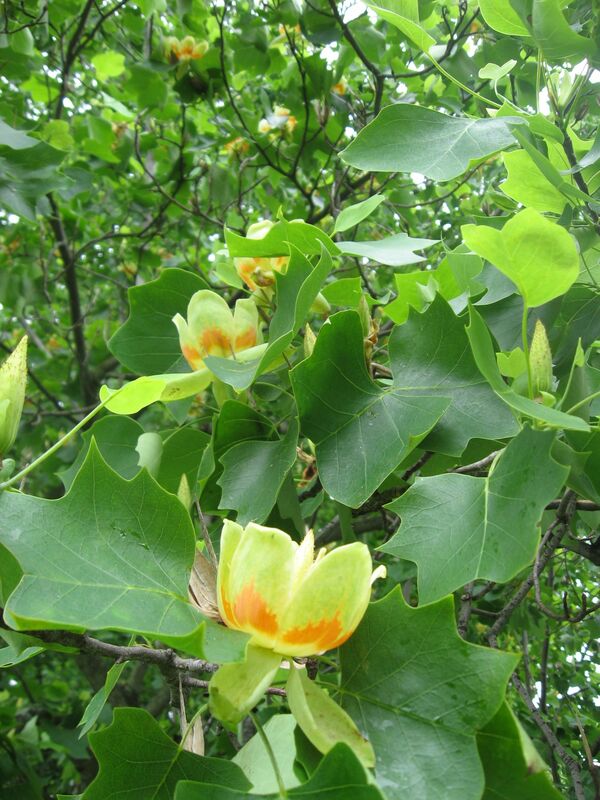 The Tulip Poplar has become a post-Chestnut forest tree, and we need to know what that means. The tree remains a constant presence in our lives. Its super straight and tall stature continues to impress us. We admire the dark green leaves, and the way the young leaves open up, curled in a protective sheath until they are ready for the world. The seed cones are impressive in their shape and the simplicity and elegance of its delivery system. The flower is the most elegant and colorful. It is truly a beautiful tree. 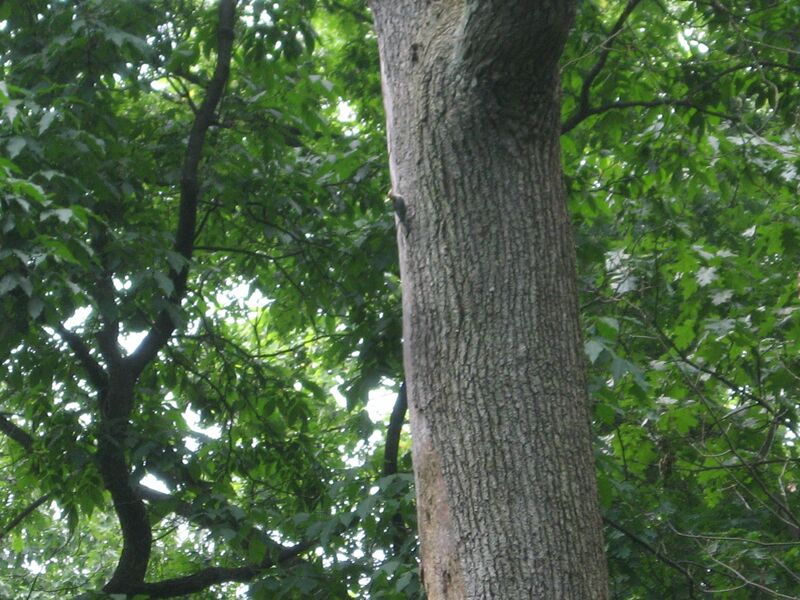 Because its wood is soft and it has a tendency to break, this tree is best admired off in the woods and not recommended for planting near homes or as street trees. Its grand size and soaring height can also give us a hint of what an American Chestnut must have been like before the blight.